Clinical Tests reveal the only REAL solution to H. pylori. Struggling to get rid of an H. pylori infection? Tired of searching for a real cure for your stomach ulcers? Your troubles are over - get the full story behind Matula Herbal Formula - the herbal formula proven to be the biggest breakthrough in the safe and effective eradication of H. pylori, the main cause of nearly all types of stomach ulcers. Have you been diagnosed with Ulcers or H. pylori? If so, STOP! and consider the benefits of the perfect natural alternative - Matula Herbal Formula™. It is light years ahead of any other treatment you will find anywhere....and we can prove it! That's right - 100% natural Matula Herbal Formula™ is SAFER and CHEAPER than the most commonly prescribed antibiotics and it is proven to be TOTALLY EFFECTIVE in the eradication of all strains of H. pylori bacteria. Matula Herbal Formula™ is also effective in relieving the symptoms of other digestive disorders, including candida overgrowth and acid reflux! It has taken over us over 8 years to finally make this amazing remedy available to you! Matula Herbal Formula™ works by removing the cause of the problem - not by treating the symptoms month after month! Take a few minutes to read why you can easily and safely use Matula Herbal Formula™ to treat the diseases that conventional medicines battle with. Where does Matula Herbal Formula come from? On the southern tip of Africa there is a wealth of fauna and flora with well over 21,000 plant species listed. Most of these plants are indigenous to this country and in many cases endemic to certain areas. Here's the interesting bit - it has been established that over 3,000 of these plant species possess exceptional medicinal properties! The indigenous people such as the San and Khoi tribes who have populated this part of the continent for hundreds of years, had to find and develop their own resources and remedies for diseases and illnesses. There were no doctors just around the corner in those days. These people lived off the land and by trial and error they managed to develop an impressive number of natural treatments. A few of these people became traditional healers and utilized their knowledge by treating their neighbors and others in nearby settlements. Over the ages, the recipes for these remedies were handed down from father to son, improving with each generation. When the European settlers moved in to the country, they adopted many of the remedies. These traditional remedies are derived from plant material such as bark, leaves, stems, flowers or roots. The plant material is normally chopped into smaller pieces and then dried in the sun till completely dry. In most cases, the mixture of herbs is then ground to a powder and often mixed with other plant materials, before being dispensed to the patient. The final preparation, often carried out by the patient, is either to add the powder to cold water, leaving it to draw for 24 or 48 hours, then to strain it and take as instructed. This is known as an infusion. Alternatively a decoction can be made by adding the powder to boiling water, similar to the way we make a normal cup of tea. Why a liquid herbal formula infusion, and not pills? A herbal infusion is one of the finest forms of treatment simply because it is a liquid. Liquids have superior absorption of the active ingredients into the body and this improves the healing process. It is even more important to have a liquid treatment when the purpose of the treatment is to eradicate bacterium like H. pylori in the stomach. The reason for this is that a liquid covers a greater surface area of the stomach lining and saturates the bacteria in the liquid allowing enough time for it to be killed off. If you can imagine a tablet or capsule sitting in one small area of your stomach lining slowly dissolving, it becomes quite obvious that it cannot be as effective. This explains why infusions and teas have been used as a medium for effective treatment for many centuries already. main cause of stomach ulcers." These are well worth viewing - please click on the links below to find out more! This world renowned Immunologist tells how effective Matula Herbal Formula is, and personally endorses Matula Herbal Formula. Some awesome reports from our customers who have been cured at last. Matula Herbal Formula™ is comprised of a specific ratio of flowers, leaves, stems from six different plant species, some male and some female. Each of the six plants are picked at different times during the four seasons of the year. Some are picked when budding, some when flowering, and others after seeding. Some plants can only be picked in the early morning, while others are picked in the late afternoon. This proprietary formulation comprises premium quality, ALL NATURAL wild and non-GMO herbs. 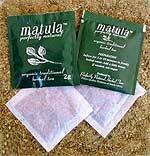 Matula Herbal Formula™ is conveniently packed in sealed and protected sachets. A total of 60 Sachets are then packed in a box that makes up a one month supply. Matula Herbal Formula™ DOES NOT CONTAIN any traces of wheat, caffeine, gluten, corn, soy, milk, egg, sugar, colorings or preservatives. Matula Herbal Formula™ is packed in an FDA Approved facility and has a 2 year shelf life. Prior to grinding and mixing, all plants have to be sun dried for up to 2 weeks. This is a very important part of the 100% natural process - these plants cannot be dried in an oven. For some reason, the effectiveness of the herbs drops substantially when the natural process of drying is replaced by artificial means. The harvesting of each of the 6 plants is seasonally linked to its botanical make-up, the mineral content of the soil, and the influence of climatic variations. Most of the growing areas are very difficult to access from the ground. In these areas our highly experienced pickers have to be transported by private helicopter and spend several days at a time hand picking strictly limited quantities of the medicinal plants and herbs we use in Matula Herbal Formula™. Because these herbs are indigenous to this part of the world only, harvesting is strictly controlled. Over picking can quickly jeopardize future supply, or even cause extinction of these species. As a further precautionary measure, our pickers are paid according to the quality and freshness of their pickings, rather than the quantity they can pick. Matula Herbal Formula™ is a 100% natural product and may be taken with other medications, such as NSAID's and even antibiotics, without any side effects. Clinically proven antibacterial properties of Matula Herbal Formula™ completely eradicare all traces of Helicobacter Pylori. Matula Herbal Formula™ further helps to stop bleeding and other damage to the intestine wall and reduces stress of the immune system. Matula Herbal Formula™ regulates the production of stomach acids that promote the healing of heartburn and reflux disease, with a resulting overall calming effect. Matula Herbal Formula™ promotes the healing of affected tissues. Want to get rid of H. pylori for good? 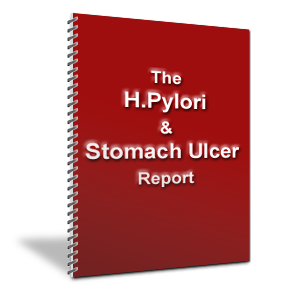 The proven cause of 80 - 90% of all types of stomach ulcers is Helicobacter Pylori (more commonly known as H. pylori) - a hardy bacteria which is becoming increasingly resistant to most antibiotics. This may came as a surprise to some, but these are the facts! The good news is that you can now get Matula Herbal Formula™, a 100% natural remedy that COMPLETELY eradicates all strains of H. pylori - without any negative effects. This 100% natural remedy is now recommended by Doctors, and is also personally endorsed by world renowned Immunologist, Professor Patrick JD Bouic Ph.D.